How was the first edition? Typeparis16 is already the second edition of type design programme launched in 2015. We are in constant contact with all attendees from last year. We thought that it would be interesting to ask some of them a few questions about their experience, past and future. Dave Coleman, Kara Gordon and Ilya Naumov share for you, their answers. Kara Gordon, TypeParis15, June 2015. 1. 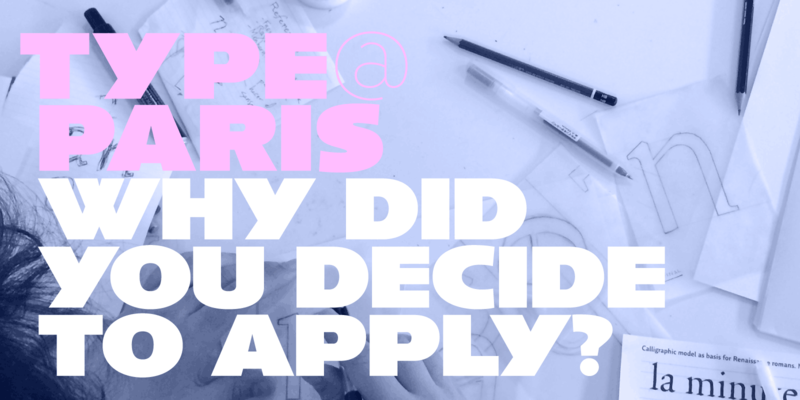 Why did you decide to apply to TypeParis15? Dave Coleman: I didn’t want to half-arse type design. I had been a self-taught graphic designer for years, and whilst I certainly got by, I didn’t thrive or excel like I wanted to. I realised my DIY attitude wasn’t going to get me far enough. I had also recently been encouraged to specialise more, and type design and lettering had become my focus. My goal in applying for TypeParis15 was to learn type design secrets from the best – especially as there are precious few online resources for a lot of the subtitles and nuances of type design. Kara Gordon: TypeParis came at the perfect time. I was a recent grad and the contract for my job was coming to an end. I’ve been interested in letters pretty much all of my life, and I’ve wanted to pursue typeface design professionally for quite some time. TypeParis15 was a way for me to affirm that and really see if I could handle a longer post-graduate programme. It also gave me the confidence to really pursue my passion for type and gave me the skills to start making that dream a reality. Ilya Naumov: In 2015 I was looking for an intensive type design programme in Europe. I had already done TDi at Reading University and felt like it was too short, so I was looking for something more in-depth. I heard about TypeParis15 sometime in January/February and decided to apply. Ilya Naumov, TypeParis15, June 2015. DC: I learned as many of the aforementioned secrets as I believe one can, given 5 weeks. Type design is an extremely dense and fascinating discipline, and there is a lot to discuss and unpack when learning about it. I was left hungry for more, which is definitely not a bad thing. For me, TypeParis was the perfect mezze plate for determining whether type design was for me. The instructors and guest critics were well-chosen and passionate. They gave their time willingly, and felt eager to teach us as much as possible in the time given. It was such an honour to meet the rest of the TypeParis family (attendees), and we quickly became friends. It was so wonderful being surrounded by so many people that shared a love for type – but with so many different backgrounds, skills and passions. hands down one of the best aspects of the program. Of course, spending two months in Paris is an incredible experience too, and the Vélib’ bike service was an amazing way of getting around. KG: I learned so much during TypeParis. In a really basic way, I learned how to build a typeface from the ground up, rooted in calligraphy. I learned how to use the software. I learned to look at type in different ways (when I look back at my original sketches… wow). In a bigger way, I learned that typeface design is really the thing I can sit and do for hours at a time. I can be a bit hyperactive and it takes a lot for any activity to consume my work and attention the way letters can. I would be remiss not to mention how much I learned about different cultures and different ways about thinking about type and design and living. I think that was the true gift of going to an international programme—many very very different people who all came together to nerd out about type. IN: I feel like I really learned a lot: calligraphy, sketching, type design, history. Meeting with top professionals in type design business was sometimes challenging but definitely very rewarding. One of the most important exercises that I take out of TypeParis15 is designing with a historic model in mind. Dave Coleman, TypeParis15, June 2015. DC: TypeParis15 absolutely propelled my career in type design forward. If I was uncertain about my direction beforehand, I had no doubts after graduating. I am about to finish Buffon, the typeface I worked on during the 5 weeks of the program, and I have a number of other typefaces in the works that I am very excited about. My goal now is to apply for Type and Media at KABK 2017/18 to continue my studies. Also, my wife Laura and I had a kid in October, and she is cutest and most fun thing ever. KG: I’m working at the magazine I worked at before TypeParis15 (they hired me full time after the programme). I’m definitely more confident in my work and embrace this specialty. I’ve partnered up with another designer when taking on client work because of my experience in letter-making (she’s a much stronger product designer). My hope is to apply for a master’s programme in typeface design, and I’m gearing up to make 2016 about preparing for that process. IN: I work as a freelance graphic designer and I am currently re-working Belka – the type family that I started during TypeParis. I feel like everything I learned about type design helps me in my day to day work as a graphic designer and gives me a big advantage over somebody with just a basic knowledge of typography. In the future I want to dedicate more time to type design. Just follow the application process as explained on Program page. Deadline for application this year is 15 March 2016.